Urishay is the twelfth century former chapel of Urishay Castle and is preserved as a part-ruin. It is a Grade II* listed building and scheduled ancient monument. In fact it is the earliest purpose-built castle chapel in Herefordshire, and beyond it is the mound on which the motte-and-bailey castle was sited. The present ‘castle’ dates from the 17th century and takes the form of a ruin simply because the someone took the roof off rather than repair it in 1921. 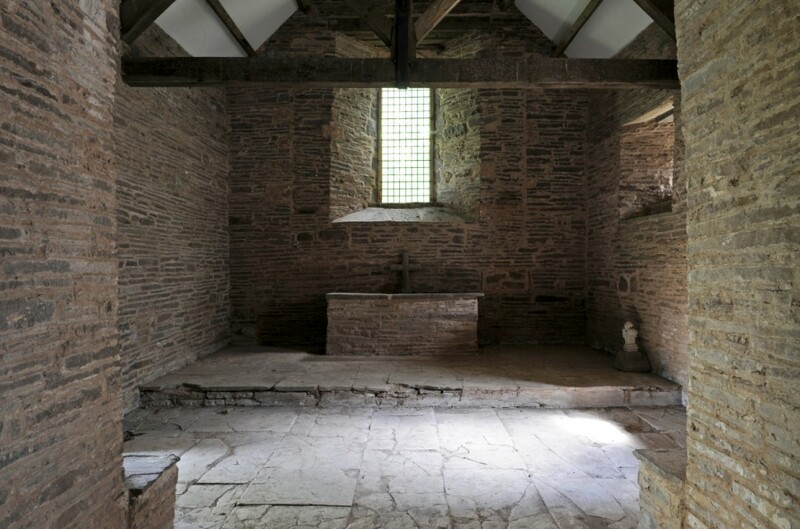 A medieval altar table with five consecration crosses survives inside the chapel, together with evidence of later work – notably in the 16th century – but the use Urishay over the years as a blacksmith’s forge, a carpenter’s shop an a dog kennel have taken their toll. In the early 19th century the chapel was purchased by ‘ a small committee of churchmen’ and after a report had been prepared by the SPAB (Society for the Protection of Ancient Buildings) the chapel was repaired by the same family that built it, as the wooden tablet on the north side of the nave records. By 1949, as at so many ancient churches, Urishay was once again in a poor state of repair with gaping holes in the roof and leaning walls. Unfortunately when the Friends were able to take it into care finally, in 1978, we had no alternative but to rebuild much of the walling to prevent collapse. The building remains only partly roofed.